I know it’s a little early to be talking about Valentine’s Day just yet, but my life is budding out and heading for full bloom on that day this year. Following my heart on Valentine’s Day now has a very different meaning for me than the conventional one I knew as a child, and later as a younger woman. One of the most memorable Valentine’s Days of my life had nothing to do with the brightly colored lacy hearts signed by classmates from my school days, or even the most romantic one of my adulthood: the day I opened the door to a small group of a cappella singers doing a rendition of “My Funny Valentine”—one of my all time favorite songs—in beautiful jazzy four part harmony—a very special performance my sweetie had arranged for me that year. In 1996, all those memories would shift position. Valentine’s Day would become the day I was told by the neurologist that I did indeed have the diagnosis of Multiple Sclerosis. I did not have a life partner to face this news with me, but a dear friend drove me the 90 miles each way to see the doctor and receive the news. It was cold and icy and getting dark on the road home, and we were both very quiet. The next day or so I remember her telling me that she was really angry about me having MS. I also remember telling her that I could understand that, but since I had enough to deal with just absorbing the diagnosis, I couldn’t help her with that, but I hoped she had other people in her life who would be able to listen to how angry she was. Like the fantastic person she is, she went away and thought about that, and came back the next day to shovel the sidewalk, telling me that was the smartest thing I could have done for myself, and for her, too. As with so many important things in life, this bitter news came with something sweet. February of 1996 was also the month my first book of poems, The Rings Around Saturn, came out. I managed to give two readings locally, but was too unwell to travel and promote the book any further. Although I had tried and benefitted from lifestyle and diet changes and alternative body work, over time their effectiveness began to wane. Twelve years after diagnosis, I found myself sliding toward what seemed like a permanent seat in a wheel chair. It was early Winter of 2008 when I learned about and decided to go completely plant-based and oil free. Since it was almost Valentine’s Day, I made that the official anniversary of my transition to this way of eating, so I could reframe the original anniversary in a new and healing light. I had just found Susan’s blog. My Valentine’s Day dinner to myself was her wonderful My Favorite Lasagna, a green salad, and Skinny Figgy Bars. I even lit some candles. And if you read my blog, you know quite a bit about the rest. I became friends with Susan. I read Dr. Swank and Dr. Jelinek. I found Dr. McDougall, and Dr. Campbell, and Dr. Esselstyn and Dr. Barnard and Dr. Fuhrman. I just kept slowly doing better and better, until I was able to record some of what was happening for myself and my son, until I got brave enough to share some of it on the McDougall forum. Then Susan invited me to write a blog about it–and I was ready and able to say yes. The poetry writing blossomed. And then this past year the art blossomed, too. It was February of last year when I learned that I had won 2nd Honorable Mention in the Poetry Chapbook Competition at Finishing Line Press, and that If A Sparrow (now on Amazon!! If you’ve read it, maybe be the first to write a little review?) would be published. I spent Valentine’s Day up in Coeur D’Alene with my friend Clark. I hadn’t been there in 17 years. We walked out by the lake and enjoyed watching the giant koi in the huge resort aquarium. So I guess I shouldn’t be surprised that when I went to check on exactly when in February my art show goes up at the Co-op, the customer service manager looked at the calendar to see what date the 2nd Friday in February fell on, and it was–you guessed it–Valentine’s Day. So this coming Valentine’s Day, I will be celebrating my good plant-based life with the opening of my one woman art show at the Moscow Food Co-op. I think I will call it “Then and Now” and my artist’s statement will touch on the story I tell in Listening To The Earth, about how 14 years ago I was invited to have an art show at the Co-op, and now I am finally well enough to do it. If you were able to be at the show in person, you would see many of the original drawings and paintings which illustrate my blog posts up on the wall. Your faithful reading and enthusiasm for my personal “renaissance” as I return to drawing and painting has helped make this possible, too. I’ve decided to celebrate all this amazing wonderfulness by designing some Valentine cards. It isn’t something I thought I could do. Last December when the card buyer at BookPeople said she’d look at anything I came up with that had a heart on it, I thought to myself, “fat chance of that happening.” But it turns out I was wrong. Prompted yet again by another artist who, upon learning my show would open on Valentine’s Day said, “If you have anything with a heart on it, you’ll sell it.” So I gave it a whirl. The pomegranate “heart” at the top of this post was a big hit with the card buyer, and she’s going to carry it on concession. I’ll offer them for sale at the art opening, too. I’m thrilled to say another of my designs will also be on consignment at BookPeople, where I read last October. It looks like the Co-op may carry some of my cards, too. And I just may send a Valentine or two of my own to the many people in my life I am privileged to love. Since I don’t have a special sweetie myself (besides Romeo), I really like the idea of spreading the Slow Miracle love with valentines for everyone instead. So I’m showing you what the possibilities are, too. I would love to hear back from you which ones you’d like to see me offer in the Slow Miracle Art Store. I don’t know how to do this yet, but I’d also like to find out how to give a set of cards away here on the blog too. So stay tuned for that. The first one is the image at the top: my pomegranate heart valentine. This will be at BookPeople, and also at the art opening. So let me know if it’s one you’d like me to offer here. I’m not sure all of these will lay out in a way that will work or that I’ll be able to afford to offer them all–I’ll find that out on Tuesday when I go to Archer’s to set them up as cards. I’ll be doing the top one and the Romeo one for certain. So I might offer a pack of 4–with 2 of each of those in the Slow Miracle Art Store. I’d welcome knowing if that option appeals to you, or which of these others you might like to order if they can be worked successfully up into cards. I want to order enough printed to be able to include you in the Valentine fun. Because really, you are all my valentines. Thank you thank you for filling my heart with gratitude and joy each time I hear from one of you!! It feels every bit as full as the ripest pomegranate. Thank you, Maria, for sharing your heart full of love with us. The two you selected are also my favorites, though they are all fabulous. And thank you for your blog. It is so helpful to hear success and shared recipes from someone who chooses a more narrow dietary path for the benefit of expansive health. The good doctors you mention are all quite wonderful in their own right, but seem oblivious to gluten free and non-GMO options! You and Susan save the day with your contributions. Your artwork is beautiful! 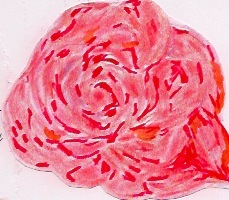 Love the rose! How pretty they all are! And isn’t Valentine’s Day quite the powerful life changing day for you. So wild. I love them. And I will purchase some when you have them up and ready in the online store. I like the idea of a pack that has multiple cards – perhaps 6 instead of 4, 2 of each. But I’m definitely on board. 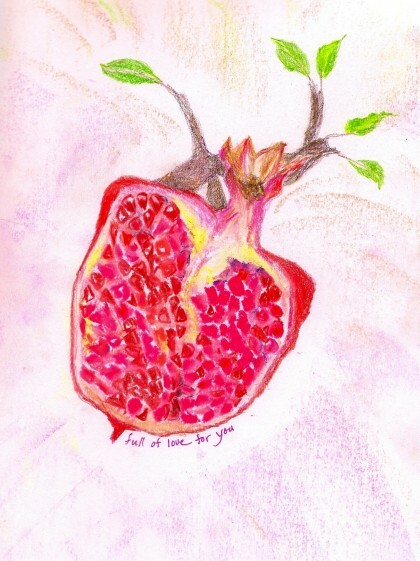 i never thought of a pomegranate as a heart, but it is truly filled with love as are you. Thank you, Maria, for sharing this story with us. The see-saw of emotions on Valentine’s Day – I’m so glad there was a positive (and more as time goes on!) to help swing things upward. Congratulations on working through and never giving up on getting better. There is always hope. And your strength is amazing. It’s so exciting about the poetry and pictures! To see your creations blossom and expand and meet other eyes is a gift many don’t get to experience. The V-day cards are a great idea!! I love the two pictures you’ve chosen – pomegranate heart and Romeo, and I also like the pomegranate love one. In fact, I love all of them, but if you’re limited in quantity, then those are the three I think would make the best V-day greetings. Although the last two have stunning colors. So I don’t know! It’s a tough call. But I think whatever you choose will be a hit. I would definitely order a set. I just love to hear your story. You are such an inspiration, and I truly hope your showing is a success. I’ve told many people about your blog & how patient you are with yourself. I know more people need to learn this quality. I just love the art you’ve chosen for your cards & think you have a special talent. Thank you for sharing yourself & your struggles & victories with us. Thank you so much, Kim, for this beautiful comment. Patience with myself is always a work in progress, but it well worth the effort. I’m so happy you love the art I’ve chosen for the cards–you made my day with your kind words and enthusiasm for what I’m doing! 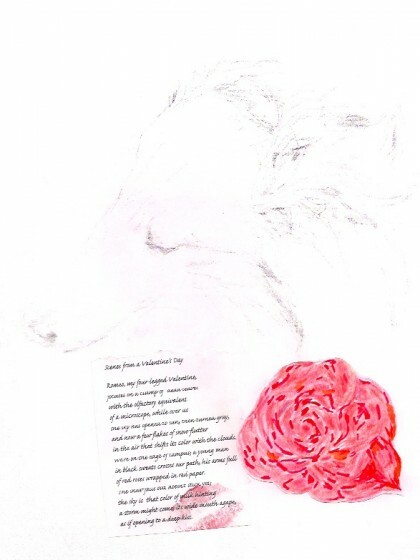 Hi Maria, thank you for sharing your beautiful artwork with us! My absolute favorite is the pomegranate, full of love for you. 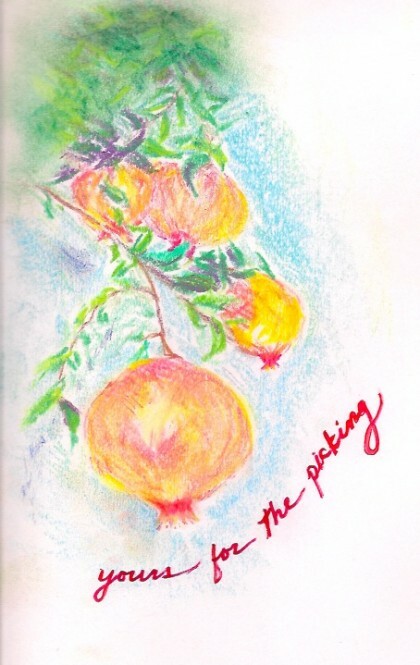 I also love ‘yours for the picking’. Of course I love them all, but those two especially. I would love to see you offer an assortment of Valentines Day cards. 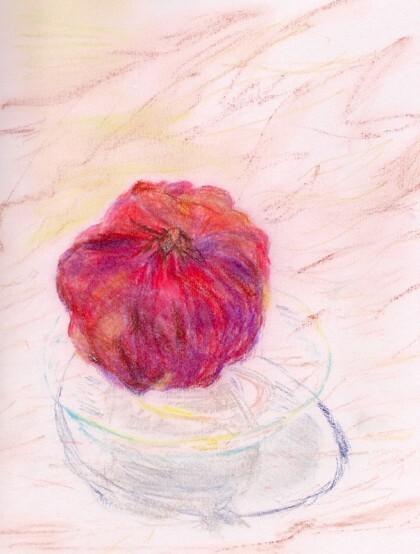 If I may share a pomegranate memory, when my husband was alive (he’s been gone since 2001), he used to always buy a pomegranate for our two daughters to share on Christmas. It became a sort of tradition. So now, I always try to make sure I get a pomegranate at the holiday. My girls are 36 and 27 years old now and I believe in keeping traditions alive and also the memory of their father, of course. I have become plant based myself over the past year or so. I have lost a lot of weight and have become the healthiest I have probably ever been. My doctor took me off all my meds (blood pressure and cholesterol meds). I am 65 years old! Drs. Fuhrman, MacDougall, Campbell, and Esselstyn are also heroes of mine. Also Chef A.J. In my vegan journey, I discovered Susan’s blog and therefore yours and I am so very glad I did. Thank you for sharing all of your insights, you are a wonderful writer and truly an inspiration. Hi Virginia and welcome! Thank you for this lovely comment–it was such a pleasure this morning to open up my e-mail and find it waiting for me! I really enjoyed reading about your tradition of having your girls share a pomegranate on Christmas. What a beautiful tradition and way to remember their father as the years go by. I am also so happy to read of your own progress on a plant-based diet–that is just wonderful!! We have the same heroes! (I really enjoy Chef AJ too) I am glad you found my blog–it’s great to have you along! I was hoping to see these beautiful cards in your store as a set. I think you were looking into that when you posted the blog. Were you able to get them printed? They will make lovely letters for a few of my friends who sometimes need a little cheering and a reminder that they are loved, even if it is from afar. Thanks for your interest in the Valentine cards. My printer had a delay in a card stock order. They expect the card stock to arrive this afternoon, and I will put them up in the store over the weekend. At least that’s what I’m hoping. I hope to be able to start shipping them next week. I will e-mail when I have them up, and I will also put a blog post up announcing they are ready to ship. Thanks for your patience. So glad you are interested in the cards!